A kid-friendly fava bean pasta! Fava beans are a type of fresh bean, which is an April Foods of the Month. Fava beans are also one incredibly healthy food! Most times, people bypass them at the grocery store because they don’t know how to use them. In Italy, this Fava Bean Pasta recipe is a popular lunch option since it is simple and easy to make. 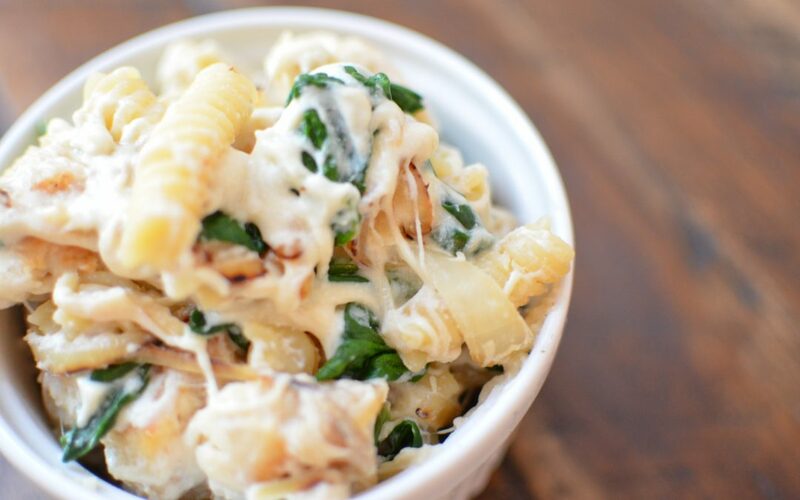 And, anytime you mix vegetables with noodles and cheese, you get a kid-friendly dish! Fava beans are close relatives of legumes like black beans and split peas. Unlike other dried beans and peas, you will most likely find fava beans in the frozen vegetable section of the grocery store, along with green beans, lima beans and edamame. To prepare them, simply boil on the stovetop, like you would with green beans (another type of fresh bean). 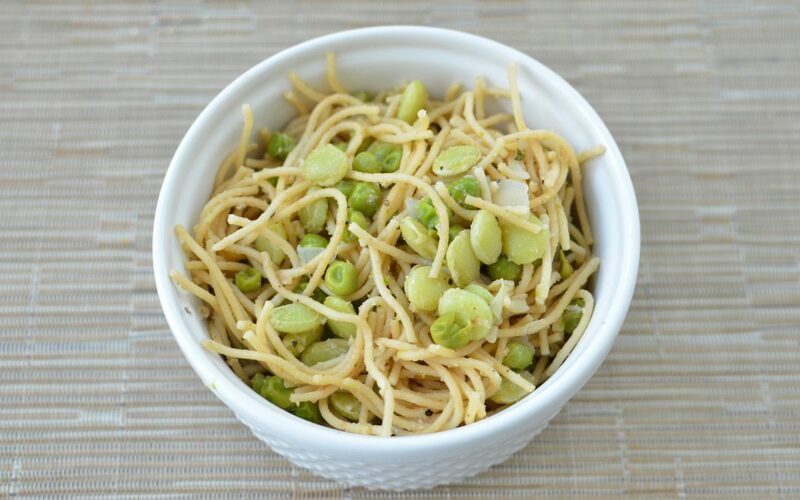 This Fava Bean Pasta dish is a nutritious lunch or light dinner option. Fava beans are full of folate, which is an important nutrient to keep the cells in our body working. Fava beans are also a good source of fiber, iron and manganese. We recommend serving this Fava Bean Pasta dish with a nice serving of freshly grated cheese for some added calcium. Enjoy! Cook spaghetti according to instructions, set aside. Meanwhile, boil peas (fresh or frozen) for about 5 minutes, until they are tender. Drain and add to pasta mixture. Next, shell the fava beans and cook in boiling water for 3 minutes. Let the beans cool and remove the outer skin. Mix in with the pasta and peas, add the whole wheat bread crumbs, a drizzle of olive oil and salt and pepper, to taste and the freshly grated cheese. Enjoy! Not all nachos are cheesy, greasy, and full of junk. Try making nachos with apple slices instead to get a serving of fruit, fiber and natural sugar. The result are these Nutty Apple Nachos. 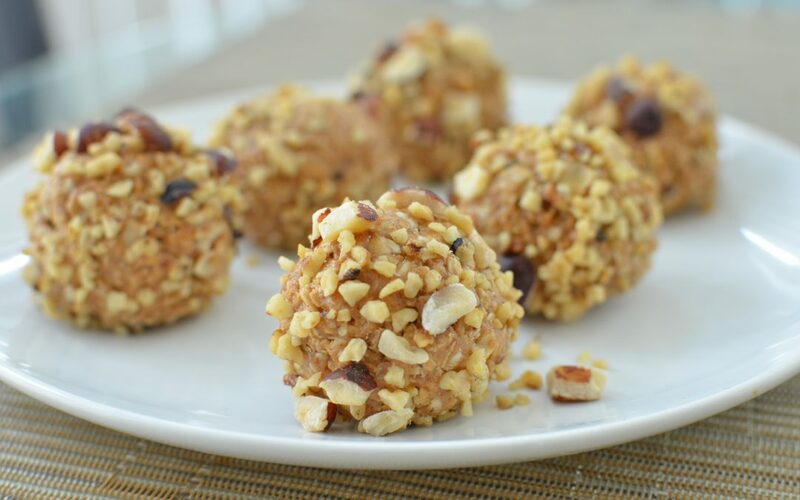 They are a perfect party dessert that is healthy too! These Nutty Apple Nachos are the perfect combination of nutritious and indulgent. We chose walnuts to crumble on top of our nachos base because they are high in magnesium, protein and good fats. Walnuts also help to decrease the risk of cardiovascular disease. Next, we add all natural peanut butter for more protein, and a drizzle of melted dark chocolate so the nachos feel a little more like dessert. Look for dark chocolate that is 70% or more cacao. A higher cacao concentration means more fiber, iron, potassium and zinc. Who knew that a little bit of chocolate could be good for the body? 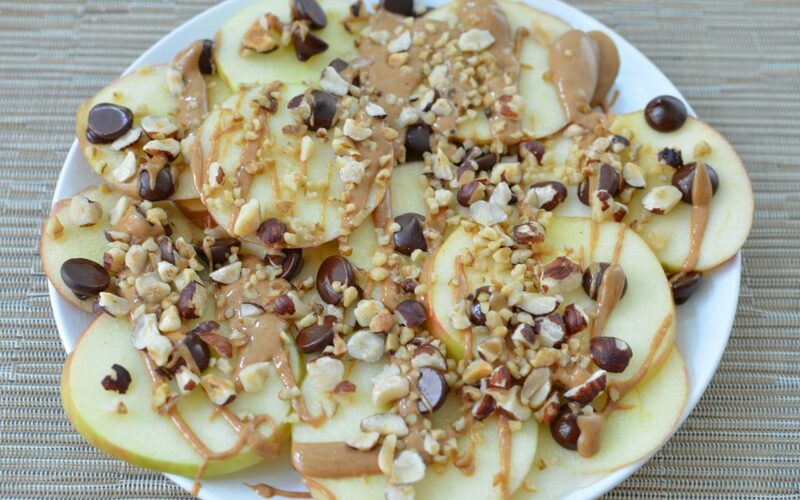 Try these Nutty Apple Nachos and you will not be disappointed. They are the perfect combination of sweet and salty. They are also full of nutrition! Have you ever eaten hummus? Hummus is a traditional dish from the Middle East/North Africa that is made with chickpeas. It’s the perfect creamy dip for crackers and vegetables. In fact, over 15 million Americans say that they eat hummus, so you are in good company if you have tried hummus before. If not, you can definitely find this tasty snack in your local grocery store and in restaurants. Hummus can be purchased in those places, but it can also be made at home. 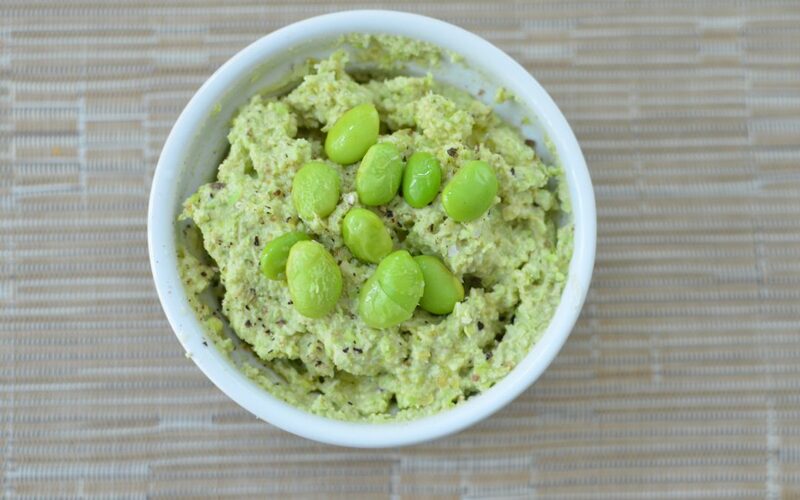 We love this recipe for Homemade Edamame Hummus. If you’ve had hummus on your radar for quite some time, you’ve probably begun to see all the different variations at your grocery store. There’s hummus made with black beans, white beans, and… edamame! Edamame is a type of fresh bean that is also an April Foods of the Month. 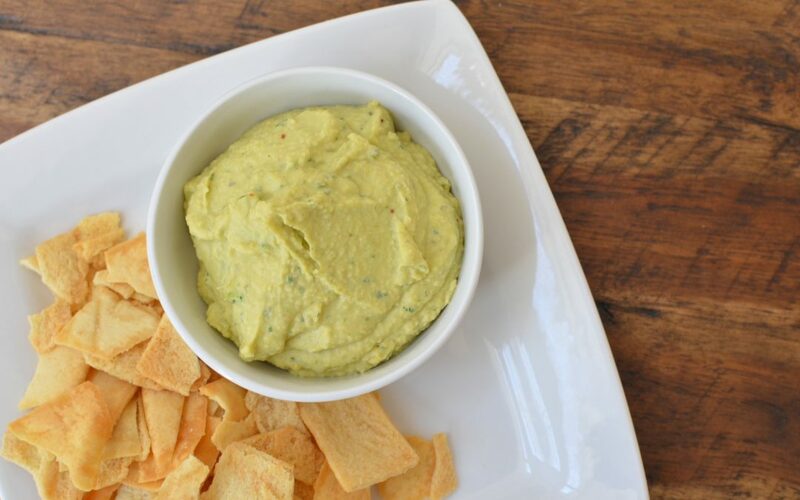 It’s also a perfect base for this Homemade Edamame Hummus recipe. Boil the edamame in water for 4 to 5 minutes, or microwave in a microwave safe dish for 2 to 3 minutes. In a food processor, blend together the edamame, tahini/peanut butter, water, lemon zest and juice, garlic, salt, and cumin until smooth. Drizzle in 2 tablespoons of the olive oil and mix until combined. Transfer to a small bowl, stir in the parsley and drizzle with remaining oil and garnish with extra parsley and full edamame beans. Serve with carrots, celery, cucumbers, olive and crackers. This quick and easy Chickpea Celery Dip recipe is a delicious plant-based snack. Enjoy this dip, which only takes a few minutes to eat, after school or after lunch. Usually, we think of celery as something that you use for dipping, but in this recipe, the celery is in the dip! Celery is also a stem vegetable, which is a March Foods of the Month. We love that this Chickpea Celery Dip recipe is full of nutritious ingredients like chickpeas, celery, herbs and Greek yogurt. Chickpeas are packed with fiber, protein, and other important nutrients like magnesium, and iron. Celery is naturally very low in calories and provides some fiber too. Impress your friends with this dip recipes. It’s a fun way to put a stem vegetable in a dip. Serve with whole grain crackers, pretzels or pita chips. Transfer the dip into a serving dish and serve with your favorite healthy crackers. Enjoy!